Introduction: Fair market value (FMV) is the reasonable selling price of a business, stock, real estate or other assets. An estimate of fair market value may be founded either on precedent or extrapolation. Fair market value differs from the intrinsic value that an individual may place on the same asset based on their own preferences and circumstances. It is a term commonly used in tax and real estate, FMV has come to represent the price of an asset under the following usual set of conditions: Prospective buyers and sellers are reasonably knowledgeable about the asset, behaving in their own best interests, free of undue pressure to trade and given a reasonable time period for completing the transaction. Given these conditions, an asset’s fair market value should represent an accurate valuation or assessment of its worth. People often feel that houses, art, stocks, bonds, and other items are “worth” a certain amount on the market, but the only true measure of worth — the fair market value (FMV) is the price at which someone is willing to sell and someone is willing to buy. Let’s assume John Doe wants to sell his house. He lists it for $750,000. Jane Dale wants to buy a house. She sees John’s house for sale and offers him $675,000. The two negotiate the price and agree on $700,000. Because it is the price John and Jane agree to, the fair market value (FMV) of the house is $700,000. 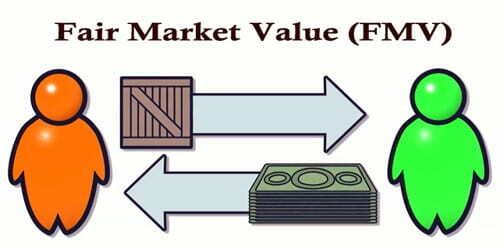 The term fair market value (FMV) is intentionally distinct from similar terms such as market value or appraised value because it considers the economic principles of free and open market activity, whereas the term market value simply refers to the price of an asset in the marketplace. The term fair market value (FMV) is used throughout the Internal Revenue Code among other federal statutory laws in the USA including Bankruptcy, many state laws, and several regulatory bodies. In litigation in many jurisdictions in the United States, the fair market value is determined at a hearing. In certain jurisdictions, the courts are required to hold fair market hearings, even if the borrowers or the loans guarantors waived their rights to such a hearing in the loan documents. 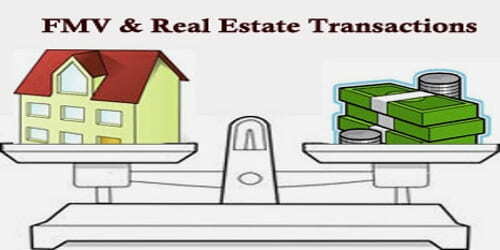 For Transfer of Ownership – The fair market value is crucial to know anytime property ownership is being transferred. Knowing fair market value allows a homeowner to fully understand the value of his or her property to avoid being taken advantage of. It also helps the buyer know how much is too much to pay for a property. For Tax Purposes – Worldwide tax authorities are always ensuring that transactions, especially those made between people not dealing at arm’s length, are realized at FMV, at least for tax purposes. Municipal property taxes are often assessed based on the fair market value of the owner’s property. As the difference between the purchase price and the property’s fair market value can be substantial, tax authorities are interested in knowing the current fair market value. For Insurance Purposes – Fair market value is also often used in the insurance industry. For example, when an insurance claim is made as a result of a house burning down, the insurance company covering the loss will often only cover the amount up to the fair market value. Uses of Fair Market Value (FMV): Fair market value (FMV) generally means the highest price, expressed in dollars, that a property would bring in an open and unrestricted market between a willing buyer and a willing seller who are both knowledgeable, informed, and prudent, and who are acting independently of each other. FMV refers to the value that people might reasonably expect to get for their items on the open market. FMV is also often used in the insurance industry. For example, when an insurance claim is made as a result of a car accident, the insurance company covering the damage to the owner’s vehicle usually covers damages up to the vehicle’s FMV.